Windows 10 users are currently getting Error Code 0x80240fff. This Error pops up whenever users tries to Download and Install available Updates on Windows 10. 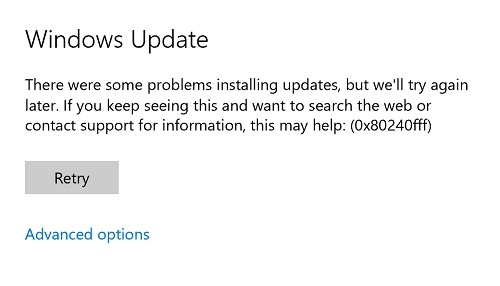 We have Noticed that mostly users who are on Windows 10 build 10240 are facing this issue. If you too are on this build and getting the same error, then do not worry, you are not alone. Rejoice, Because We are here to Solve the issue once and for all. So without taking much time, let us get straight to the Point. After Some research, we have found a Simple Solution to the Problem that we will be sharing. All we are going to do is Check the Box against Defer upgrades option. And your Problem is solved. What it will do is, it will change the servers from where your Updates are installed. There are few more important things that will change if this option is selected. You can Read more on Defer Upgrades Here. Ok, So now let us see how to Enable this option so that Error code 0x80240fff while updating can be solved. Tried to install updates but was Presented with an error message instead? The Message should be exactly as shown at the Start of this Page? if Yes, Perform the below mentioned steps. Note: If you are using Windows Home version, then you won't find Defer Upgrades by Performing below steps. Windows Home Users will have to download Windows Media tool and use Upgrade this PC option. Step 1: Simply Click on Advanced Options under Retry button. Refer to above picture to get the idea. Step 2: Now scroll down a bit and Check the option Defer Upgrades, As shown in the below Picture. Step 3: That is it, Now go back and try to install the updates again. This time, you will be surprised to see no errors like 0x80240fff. Your Updates should download and install without any issue this time. Alternatively, to Turn on Defer Upgrades option; You can do the following. Scroll down & Check "Defer upgrades" Option. This is the only Tweak right now that can fix the issue to this problem, We understand that it is not always recommended to do this as this option does much more things that affects your updates. Let us know if this small tweak helps you to fix the issue in Comments below. Let us know even if this doesn't help and you have any other method to fix this issue. Doing so will help others too having the same problem of Code 0x80240fff while updating Windows 10. For me only worked here: settings>application>all>framework google services, clear data and force stop.